SAN ANTONIO, Texas – The Hispanic Association of Colleges and Universities (HACU) today urged the leadership of the U.S. Senate to support proposed legislation to encourage more Hispanic and other minority students to pursue careers in science and technology. The Energy Policy Act of 2003, or S.14, contains components directly addressing the needs of Hispanic-Serving Institutions (HSIs), as well as other Minority-Serving Institutions serving the largest concentrations of Hispanic, African-American and Native-American students. Within the proposed Act, Subtitle C: Renewable Energy of Title IX: Research and Development is a component that would provide at least $5 million per federal fiscal year for grants to eligible HSIs and other Minority-Serving Institutions to encourage students from under-represented groups to pursue scientific and technical careers. Sub-Section 932 of Subtitle C would set aside additional funding for minority-serving institutions to become involved in activities designed to encourage under-represented students to pursue science and technical careers. “These components of S.14 would provide urgently needed funds to help reverse the under-representation of Hispanics in the fields of science and technology,” Flores said in a letter to the leadership of the Senate Energy and Natural Resources Committee, which currently is debating S.14. S.14 is the companion bill to HR 6, which was approved by the House of Representatives. Hispanics, who suffer the lowest high school and college graduation rates of any major population group, also receive less than 2 percent of doctoral degrees in all fields of study -- including science and technical fields. “As a population that represents one of every three new workers joining the U.S. work force today, we must invest in equipping our Hispanic students with the advanced knowledge and skills they will need to contribute fully to our country’s taxpayer base, progress and leadership in this 21st Century,” Flores said in his letter urging support for S.14. 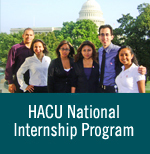 HACU represents more than 300 colleges and universities serving over two-thirds of the nation’s 1.6 million Hispanic college students.